The typical concept of a service dog involves a large dog that aids a person with a physical disability. However, as mental health problems become more accepted, there is now an increasing number of psychiatric service dogs. 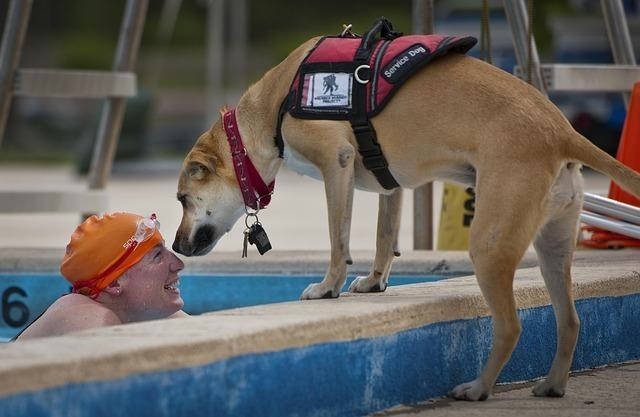 Psychiatric service dogs aid people who have mental disabilities including anxiety, autism, depression, and even Post-traumatic Stress Disorder (PTSD). Few people with PTSD even consider that they may be eligible for a service dog, yet a service dog can improve quality of life greatly in people with the disorder. If you or a loved one suffers from PTSD, here are a few ways service dogs can help. Many people who suffer from PTSD experience frequent or recurrent nightmares. These nightmares can cause sleeplessness and insomnia, leading to further repercussions from lack of sleep. PTSD service dogs are trained to help their handlers cope with nightmares by waking them when they recognize the signs of a bad dream. If they are unable to recognize the nightmare, they will be trained to offer comfort when you wake up. Comforting behaviors might be licking, cuddling, or lying on top of you. It is also much easier to fall back asleep with a dog beside you. Due to the risk of flashbacks or hypervigilance, many PTSD sufferers find going out in public difficult. They end up isolating themselves, fostering depression and addiction as a result. Owning a dog, even a non-service dog, can help prevent isolation. Dogs require exercise, leading their owners to at least walk around the block, greet neighbors, and talk to people who want to say "hi" to the dog. It may not be much, but it keeps a person from entirely isolating themself in their home. Flashbacks and intrusive memories can both make daily life very difficult, particularly when in public. A service dog will be able to keep you present with behaviors such as nudging or licking. If they are unable to prevent flashbacks, they can also be trained to keep crowds at bay or lead you to the nearest exit. This will at least remove you from the public eye and protect any bystanders from unintentional aggression during the flashback. Owning an affectionate animal, regardless of its species or training can help alleviate depression. Animals make you laugh and smile, boosting mood, while providing unconditional love and affection. They also encourage exercise which will boost mood. While a dog does not need to be trained as a service dog to have these benefits, depression and anxiety psychiatric service dogs are also something to consider. Acquiring a service dog can be expensive. Either you pay for a fully trained dog or you pay to have your current dog trained. However, the benefits a service dog has to offer far outweigh any costs related to training. They can make coping with PTSD easier by alleviating depression, aiding you in public, prevent social isolation, and even comfort you after a nightmare. Beyond all these behaviors, simply owning a dog will reduce stress and make you feel generally better. If you feel a service dog would benefit you, speak with your counselor about the next step in the process.